After World War One Great Britain, Japan and the United States had the largest navies on Earth. Further, the English and Japanese were joined in an alliance formed during the war. Their combined fleets were viewed as a threat to American interests throughout the world. American naval planners began drawing up plans for a two ocean navy sufficient to match the combined strength of Britain and Japan. Those nations perceived a large American navy as a threat to their interests. On paper huge and extremely expensive navies were designed. The governments realized the cost of a naval arms race and began discussing ways to avoid it. Great Britain was especially favorable to the idea since it had suffered greatly from the war and its economy was still weak. The Washington Naval Arms Treaty of 1921 limited construction of battleships, battle cruisers and aircraft carriers, the expensive "capital" ships. Further, it reduced fleet sizes and allowed new ships to be built only to replace older ships. However, there was no limit on smaller ships, including cruisers. Navies immediately began planning larger cruisers to partially fill the role of battleships. The United States lead this effort because it wanted ships with the long cruising range and high cruising speeds necessary to operate across the Pacific Ocean far from home waters. A consequence of the larger hull designs to accommodate greater fuel capacities and larger power plants was the ability to carry heavier armor and larger guns. The new categories "light" and "heavy" cruisers appeared. Ships having guns 6 inch or smaller were called light cruisers regardless of displacement. Ships with larger than 6 inch guns were called heavy cruisers, again, no matter what size the hull might be. Cruiser designs quickly advanced from the wartime 3500 ton ships to 8000 ton light and 12000 ton heavy cruiser designs. Britain and Japan were obliged to plan larger ships of their own to match the capabilities of the new American designs, so a cruiser arms race was underway. Realizing what was happening, and desiring to prevent a resurgence of the arms race, a new treaty was signed in 1930 that extended the tonnage limit to cruisers. The maximum size was limited to 10000 tons, and a limit was placed on the total fleet tonnage. This caused navies to compare the value of one 45000 ton battleship to four 10000 ton heavy cruisers or ten 4500 ton light cruisers. This led to a broad range of American design proposals, from lightly armored 5000 ton ships carrying 12 inch guns to heavily armored 10000 ton ships carrying 6 inch guns. Each "Treaty Cruiser" design was a trade off between guns, armor, cruising range, and treaty limits. Additional requirements, such as scouting aircraft, flag officer quarters, torpedo launchers, depth charge racks, minesweeping gear and anti-aircraft guns added to the overall tonnage, reducing the number of ships that could be built. 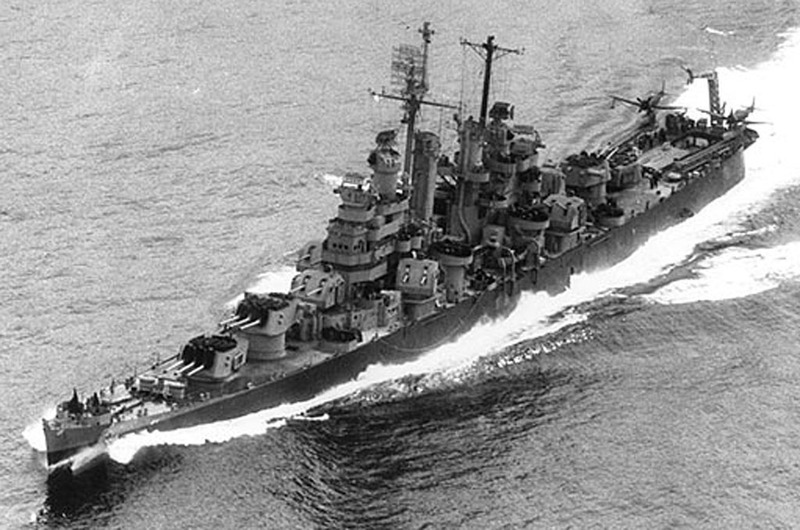 Another requirement was that new US cruisers should be superior to similar ships in foreign navies. The role of cruisers was seen to be primarily as high speed scouts that would operate independently similar to army cavalry units, ranging ahead of the battle fleet to locate the enemy. A secondary role was to fall back around the fleet and screen the capital ships from attacks by enemy cruisers and destroyers. Throughout most of the 1930s little consideration was given to the threats to cruisers from submarines and aircraft. The resulting designs were a series of large, fast, lightly armored heavy cruisers carrying relatively slow firing 8 inch guns. At the outbreak of World War Two these ships readily succumbed to aircraft and ship launched torpedoes or the combined fire of several smaller ships. The collection of aircraft and boats and their fuel amidships created a serious fire hazard that contributed to the loss of several of these ships in combat. To meet treaty limitations and still provide much needed ships for scouting and fleet screening, an 8000 ton 6 inch gun cruiser was designed and given the name Cleveland and designation CL-55. This ship had a main battery of five twin 6"/47 dual purpose gun (surface and anti-aircraft) turrets and an anti-aircraft battery of five quad 1.1 inch machine guns. However, the dual purpose 6"/47 gun was far behind schedule and would not be ready for service for several years. The 1.1 inch machine gun also was behind schedule and proving very unsatisfactory. To keep under the 8000 ton limit it had been necessary to reduce the side armor belt, leaving the ship under protected. Even with these weight limitations there was no room for expected modifications if war broke out. The compromise design was disliked by all members of the design group. Nevertheless, something was needed to fill the light cruiser role, and in March 1939 authorization was given to build two ships in 1940. On September 1, 1939 Germany invaded Poland, and the war in Europe started. This ended any obligation to the Naval treaties and allowed unrestricted ship design. Realizing that the United States might be drawn into the war, and that the US fleet was badly under strength, plans were started immediately to bring the fleet up to strength. The unsatisfactory 8000 ton light cruiser design was discarded and a hurried effort was made to find a suitable replacement. In October 1939 an earlier study design, a modification of the improved Brooklyn class cruiser USS Helena CL-50, was chosen. The original Brooklyns had four boiler rooms forward and two engine rooms aft. A single torpedo could flood both engine rooms and leave the ship dead in the water. The Helena had two boiler rooms forward, a forward engine room, two more boiler rooms and the aft engine room. A single torpedo could not leave the ship without steam or engines. The Cleveland class propulsion plant had a forward boiler room, followed by the forward engine room, the aft boiler room and the after engine room. One of the Helena's triple 6"/47 turrets was removed to allow two more dual 5"/38 mounts to be added. The new design carried four triple 6"/47 (single purpose) turrets, six dual 5"/38 mounts, plus 1.1 inch and 50 caliber antiaircraft guns. These ships had two aircraft catapults on the stern and a large hanger below the main deck. Proposed 10,000 ton cruiser, October, 1939. The overriding factor was the speed at which the new ships could enter service. The triple 6"/47 turret was already in service on the Brooklyns, and the dual 5"/38 was a very successful dual purpose design. The engineering plant was based upon machinery already in service in other ships. These factors allowed immediate mass production to begin. The new design ran into problems when the preliminary studies were being extended into actual working plans. Additional armor, antiaircraft weapons, and enlarged spaces for the engineering plant required lengthening the ship and widening the beam, increasing the ship to 10,000 tons. Even so, it was precariously close to being unstable, a problem that would follow the Cleveland class to the end of its days. The urgency to increase the fleet was paramount, and in March, 1940, two ships of the new design were ordered, to be named USS Cleveland CL-55 and USS Columbia CL-56. While the contract design of the two new cruisers was underway means were sought to improve the ship, especially to improve stability. The initial design was little more than an improved pre-war cruiser and events early in the war revealed serious shortcomings. In particular, the ships needed greatly improved anti-aircraft weapons and more effective protection below the waterline. Major changes were ordered by the time the contract design was completed in February 1941. The contractor, New York Shipbuilding Corporation, proposed a significant improvement by giving the ship some tumblehome - wider beam at the waterline than at main deck level. This improved stability and increased the effectiveness of the side armor. The hull was modified from a double bottom to a triple bottom to give greater protection against torpedoes and mines. Emergency generator power was increased and 5 inch magazine capacity was increased 20 percent. Additional modifications to the anti-aircraft battery continued after construction was started, resulting in a "final" design with four dual 40 mm Bofors guns and 15 quad 1.1 inch machine guns. The 50 caliber machine guns were considered ineffective and were eliminated. To reduce weight the 40 mm guns did not have the shields that were common on these mounts in larger ships. The 6"/47 guns were capable of elevation to 60 degrees, but the triple turret design allowed elevation only to 41 degrees. There was some discussion of modifying the turrets to allow 60 degree elevation, so the 6 inch battery could be used for anti-aircraft fire. However, the guns could be loaded automatically only at elevations of 20 degrees or less, and this resulted in a slow rate of fire at higher elevations. This combined with a relatively slow training rate for the turret gave the guns very poor antiaircraft capability. These and other considerations would require a significant redesign of the turret, which would delay production. Since it was desired to rush the ships into production as soon as possible, the original 41 degree elevation turret design was accepted. The first two ships of the class were started in 1940 and were rushed through production even though they were considered to have significant defects. During construction of the subsequent ships of the class an effort was made to improve the design, especially in anti-aircraft capability. A total of 52 ships of the class were ordered. Of these nine were converted to CVL-22 Independence class light aircraft carriers, two were completed as Fargo class cruisers, and 14 were canceled, leaving 27 to be finished as Cleveland class cruisers. The 1.1 inch machine gun continued to be unsatisfactory for anti-aircraft defense. BuOrd wanted to replace all quad 1.1 inch guns with the 40 mm Bofors gun. 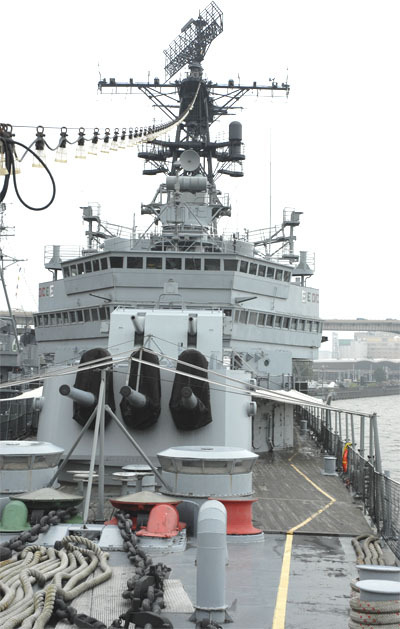 Dual Bofors mounts weighed about as much as the quad 1.1 inch guns, but the decision was made to replace them with quad 40 mm mounts to gain increased firepower. Unfortunately, even with the wider beam, the Cleveland design was too unstable to accommodate the additional topside weight. The Cleveland CL-55 was commissioned in June of 1942 with four dual 40 mm mounts high on the superstructure, but Columbia CL-56 carried the original two dual 40s aft and two quad 40s mounted just forward of midships at the O1 level when it was commissioned in July of that year. This was the beginning of a series of modifications to replace smaller caliber anti-aircraft guns with twin and quad 40mm mounts. These ships initially carried fifteen 20 mm guns arranged on the main deck, O1 and O3 levels. The initial design carried a "boat farm" amidships between the smoke stacks. Boat cranes were installed port and starboard at frame 81½. Combat experience early in the war in the Solomon Islands proved the boats and their associated fuel to be a tremendous fire hazard. Soon after commissioning most of the boats were removed and the starboard boat crane was eliminated. By the end of the war both boat cranes had been eliminated from all ships of the class. The ships were designed with air ports in the hull like previous cruisers. In January, 1941, these were ordered closed off with welded plates, and they were eliminated from all subsequent ships. In 1942 two 20 mm guns were installed on the bow just forward of the hawse pipes port and starboard. These guns were able to track targets crossing the bow, correcting a deficiency in the original anti-aircraft gun plan. A change to the anti-aircraft battery was proposed that added two twin 40 mm Bofors guns on the stern just aft of the aircraft catapults. Again, these would allow continuous engagement of aircraft crossing astern of the ship. This modification was added to some ships that were finished near the end of the war, with the larger guns in tubs cantilevered off the ship's sides, but most ships were never retrofitted (CL-55 and CL-56 both received this retrofit). Instead 20 mm guns were installed initially on all ships at these positions. Two more ships were approved in 1939 and started in 1940. In 1941 five more ships of the original design were started. Two of these were completed as CVL-22 class light aircraft carriers. As these new ships were approved a series of modifications were tried to reduce weight to allow increases in anti-aircraft weapons. A decision was made to eliminate the cruising turbines, for these were thought to be useless for high speed wartime steaming and they contributed to crowding in the engineering spaces. This was applied to all ships after CL-56. Radars were added to the gun directors and new air and surface search radars were located on the masts. The fire control radars on the Mk37 secondary (5-inch) battery directors were raised to allow a clear line of sight for the main battery Mk 34 directors. Four more gun positions were approved on the main deck, just aft of the number two turret, and just forward of the number three turret, port and starboard. Most ships received twin 40 mm guns in these positions, but a few were equipped with two 20 mm guns at each position. A 20 mm gallery with three guns port and starboard were placed on the O1 level between the smoke stacks where the boat farm had been. To control these new guns additional fire control directors were added on the superstructure. Construction was started on seven ships of a modified design in 1941, nine more in 1942, ten in 1943, eight in 1944 and one in 1945. Seven of these ships were completed as CVL-22 class light carriers. The most significant redesign was the elimination of the massive armored pilot house, located high above the center of gravity. The original round front pilot house was replaced with a smaller flat front design. An open bridge was added above the pilot house, and the wings on the signal bridge were cut back drastically to improve the firing arcs of the anti-aircraft guns. The positions of the Mk 34 main battery (6-inch) directors and the Mk 37 secondary battery (5-inch) directors were swapped to allow clear optical and radar lines of sight. The original Cleveland Class ships carried aluminum superstructures to reduce topside weight. Beginning with CL-66 this was replaced with a steel superstructure. Aluminum was available in limited quantity during the war, and the material needed to make one ship's superstructure would build a lot of airplanes. Dual 5"/38 mounts 4 and 5 were moved aft from frame 88 to frame 92. On some ships the 20 mm guns that had been located at frame 97 port and starboard on the O1 level were relocated on the sides of the after smoke stack at the O3 level about frame 82. On some ships an additional 20 mm gun was placed on the main deck port and starboard outboard the number 4 6"/47 turret. The midships 20 mm gun galleries were removed and dual 40 mm guns were installed on the main deck midships or O1 levels port and starboard just aft the forward quad 40 mm mounts. On ships with the O1 level dual 40 mm guns, davits for motor whale boats were added aft of the gun positions port and starboard, about abeam the after smoke stack. In 1943, beginning with CL-64, a full Combat Information Center (CIC) was added in the forward superstructure on the main deck. Instead of independently operating plotting rooms for each battery the CIC coordinated fire from all guns, using information from lookouts and radars to track air and surface targets and assign batteries to engage each. This was a major improvement in the defensive and offensive capabilities of these ships. All of the increases in anti-aircraft fire power carried the penalty of greater topside weight on ships that were already marginally stable. A weight saving measure was the removal of the optical range finders from the number 1 6"/47 turret (this range finder had already been removed from the number 4 turret in the original design). These were less effective on the lower elevation turrets than on the super elevated turrets numbers 2 and 3. Another measure to reduce topside weight was the removal of one of the aircraft catapults. Even with all the weight reduction measures, some ships gained from 300 to 500 tons during the war. As these changes were approved they were incorporated into all new construction. The changes were to be retrofitted to earlier ships when the opportunity allowed. This usually happened only when a ship was damaged sufficiently to require return to a shipyard. Consequently, many different combinations of these changes appeared on the ships in service. Some changes, such as the armored pilot house removal, were never retrofitted into older ships. The Cleveland class ships proved to be very battle worthy. None were lost in combat, even though some suffered severe damage. The USS Birmingham (CL-62) was especially unlucky. At Guadalcanal she was hit by two bombs and a torpedo, and was out of action two months for repairs. Then she was severely damaged by the explosion of the USS Princeton (CVL-23) while rendering fire fighting aid to the burning carrier. After two months of repairs she returned to service and was struck by a Kamikaze at Okinawa, requiring another two month repair period. USS Columbia (CL-56) was struck by a Kamikaze during the Lingayan Gulf landings, causing severe damage and fires aft, but superb damage control measures allowed the ship to continue operations. Three days later she was hit by another Kamikaze forward, and still continued operations. USS Houston (CL-81) was torpedoed twice in three days, but was saved both times by heroic damage control efforts. The ship was repaired and returned to service. USS Denver (CL-58) was severely damaged by a torpedo, but was repaired and returned to operations. USS Montpelier (CL-57) and USS Biloxi (CL-80) were struck by Kamikazes but continued operations. CL-106 and CL-107 were started in 1943. These were "improved" Clevelands that carried a collection of modifications based upon early wartime experience to improve stability and reduce susceptibility to underwater damage. They are often grouped as a new type of ship and are called Fargo class cruisers. The most obvious change was the single funnel (smoke pipe). Exhaust from all boilers was routed to the one structure. The 6"/47 turrets were lowered about a foot to give more clearance for the centerline 5"/38 mounts on the O1 level. Mounts 2 through 5 were lowered to the main deck, and the handling rooms were moved to the second deck. The main battery directors were moved back to the highest points on the superstructure, and the secondary battery directors were moved down to the O3 level just fore/aft of the number 1 and 6 mounts. The 40 mm battery was also lowered. The superstructure, both fore and aft, was reduced significantly to improve anti-aircraft firing angles. Below the second (armored) deck openings were eliminated in the transverse bulkheads. Hanger size was halved, providing more crew accommodations and freeing up space to compensate for that lost when the 5" handling rooms were lowered to the second deck. The CIC was relocated below the main armor deck. Gun elevation in the 6"/47 turrets was increased to sixty degrees. Anti-aircraft armament included six quad 40 mm amidships, two dual 40 mm on the fantail, and ten 20 mm guns on the main deck. Two aircraft catapults were installed on the stern and motor whaleboat davits were fitted on the main deck aft of midships. Thirteen ships of this class were ordered, but only nine were started. Seven of these were canceled in August 1945, so only two were completed. Nine Cleveland class hulls were converted to CVL-22 class light carriers to meet the demand for fast aircraft carriers. The conversions were completed much sooner than full sized carriers could be built, providing quick replacements for ships lost early in the war. These ships carried a smaller complement of airplanes and were much more crowded than the larger aircraft carriers. They served alongside the larger carriers in fast carrier attack groups. Immediately after the end of the war all new ship construction was canceled. Some of the partially completed Clevelands were considered for conversion to passenger liners, but this idea was abandoned and all were scrapped. Most of the operational ships were placed in the reserve fleet between 1946 and 1950. Only the Manchester CL-83 remained operational through the Korean War, and it was retired in 1956. Details of the construction and service life of the Cleveland class ships tell much about the war effort. The average time to complete the initial construction, from the time the keel was laid until the ship was launched, was 456 days. The average time to complete construction, from launching to commissioning, was 241 days. The average service life from commissioning to decommissioning after the war was 2648 days. Note: these figures do not include the Galveston. It took a little less than two years to build a ship and put it into service. The ships served for 7 1/4 years on average before they were retired to the reserve fleet. The shortest construction time was 325 days - less than 11 months - from keel to launch, for the Pasadena. The quickest launch to commissioning was 126 days, for the Topeka. Both were built by the Bethlehem Quincy yards. The longest time to completion was for the Galveston, which was laid down in 1943 but not commissioned until after the CLG conversion in 1958. Two new and very serious threats emerged during World War Two that sent naval planners scurrying to find a defense. German guided bombs and Japanese Kamikazes caused tremendous damage to even the most heavily armored ships. The US Navy started the Bumblebee program to develop a ship launched anti-aircraft guided missile with range great enough to destroy aerial threats before they could reach the fleet. This program eventually produced the "Three Ts", Talos, Tartar and Terrier. The Navy began planning an entirely new type of ship to be the main fleet anti-aircraft defense force, but it would take a decade or more to develop. An interim measure was needed to protect naval forces from the growing threat of high speed jet bombers and anti-ship guided missiles. A decision was made to convert existing heavy and light cruisers to carry the new missile systems. The first choice was the Baltimore and Oregon class heavy cruisers, but there weren't enough of these to provide sufficient defense of the fleet. Many Cleveland class light cruisers were in the reserve fleet. These were too small to carry the same amount of missiles as the larger ships, but they would have to do. Eventually five heavy and six light cruisers were converted to carry Talos, Terrier and Tartar missiles, and one entirely new missile cruiser was constructed, the nuclear powered USS Long Beach CGN-9. The Galveston CL-93 was the first Cleveland class ship to be converted to CLG, fitted with a single Talos launching system aft of the after smoke pipe. The ship had been completed 99 percent after the war and then placed in reserve without commissioning. Because of the huge size of the launching system and limited volume within the hull, the missile system had to be placed on the main deck. Almost everything aft of the after smoke pipe was removed from the hull. Below deck the 5 and 6 inch magazines were converted into a missile guidance computer room and a missile warhead magazine. The aircraft hanger was converted into crew accommodations. The CIC was located inside the armor shell forward of the forward fire room on the first platform deck. The missile magazines and launching system was housed in a large armored deckhouse on the main deck that occupied the positions of the after 5"/38 mounts and 6"/47 turrets. The missile launcher was positioned on the main deck aft of the missile house. Above the missile house a new superstructure was built that supported the missile tracking and guidance radars and the missile fire control spaces. This configuration was replicated in all of the Talos and Terrier CLG conversions to follow, with much of the Talos design used in the Terrier systems. This was done in part to ensure that the ships could be converted from one missile system to the other, since at the time the plans were being drawn up neither missile was operational. As with the original Cleveland class designs, weight and stability were a problem. The masses of the extensive air search and surface search radar antenna suite atop large lattice masts forward, amidships and above the missile house, and the missile house itself, all reduced stability. To compensate for the additional weight the missile house armor thickness was reduced to 1-1/2". As the CLG designs were developed it was decided that these ships should carry flag officer spaces. They were to be used to coordinate fleet anti-air defenses, so appropriate tactical and communications spaces were needed, plus expanded berthing for the 9 officers and 52 enlisted men of the flag staff. Later the flag spaces were enlarged again so the ships could serve as fleet flagships, with accommodations for 50 officers and 150 enlisted, with a war room, enlarged communications spaces and a helicopter landing pad. To accommodate these changes the number 2 6"/47 turret was removed and the forward 5"/38 mount was moved to its place. The remaining 5"/38 mounts 2 and 3 were eliminated. The superstructure was expanded forward and outward to occupy the space the guns formerly filled. A large flag bridge stretched across the front of the new superstructure on the O2 level, just below the navigation bridge on the O3 level. This huge new superstructure raised the center of gravity and added to the stability problem. Four of the CLGs were fitted out as flagships; the Talos ships Little Rock CLG-4 (CL-92) and Oklahoma City CLG-5 (CL-91) and the Terrier ships Providence CLG-6 (CL-82) and Springfield CLG-7 (CL-66). The Galveston CLG-3 was completed without flag spaces to rush the development of the Talos system, with the forward superstructure and guns unchanged from the original configuration. The Topeka CLG-8 (CL-67) was also completed with the original forward superstructure and guns and with the Terrier system aft. Considering the stability problems the Clevelands suffered in the all gun configurations, it wasn't surprising that the addition of the enormous weight of the missile system almost entirely above the main deck added to the stability problems. The additional mass of the tall towers and the enlarged flag spaces forward added still more to the problem. On her initial shakedown cruises after CLG conversion in 1960 the Oklahoma City reported problems with rolling and trim down at the bow. Within a few months cracks were appearing in hull seams due to hogging. The ship returned to the yards for modifications. Ballast (540 tons) was added at the expense of reducing cruising range, and stability was improved somewhat. Stability continued to be a problem so the Oklahoma City underwent another yard period where extensive weight reduction measures were performed. The Mk 34 main battery director was removed, including the armored barbet that extended down to the second deck. The O4 level deckhouse and air lookout positions around the director were also removed. Some antennas were relocated from high on the midships radar tower to lower positions on the ship, and the SPS-39 3D radar was removed. The air lookout positions on the after deckhouse above the missile house were removed. The port and starboard two-level boat davits were removed and were replaced with a single motor whaleboat davit on the starboard side. Even with these changes the ship was still precariously close to being unstable. Eventually ballast was increased to 1200 tons. The other CLGs experienced similar problems, but they were greatest in the heavier Talos ships. None of these ships had as extensive weight removal modifications as the Oklahoma City (it was the only ship to have the Mk 34 director removed), but the Little Rock carried almost 1200 tons of ballast. The hogging problems were especially severe in the Galveston, and the ship was retired in 1970. The CLGs all had another serious problem. The early missile fire control systems could only engage two targets at a time. A large number of simultaneously attacking missiles or aircraft would saturate the missile defenses, ensuring that many attackers would survive. Since attackers could potentially be carrying nuclear weapons, the usefulness of the CLGs as fleet defense ships was very limited. Talos and Terrier missiles could be fitted with nuclear warheads to extend their lethal radius, but this was not enough to protect against attackers coming from all points of the compass. The ships proved effective against small numbers of aircraft in Vietnam and they served well as flagships for the Sixth and Seventh Fleets, but they were just an interim measure to provide limited missile defense until later designs were operational, especially the Aegis cruisers and frigates. The CLG conversions took from one year and ten months for the Galveston, to three years and five months for the Little Rock. The Talos conversions took a bit longer than the Terrier conversions, and the flag conversions took longer than the others. The Atlanta CL-104 was extensively modified in 1964, with all superstructures above the main deck removed and replaced with experimental superstructure and radar designs. Redesignated IX-304 the Atlanta was used to test susceptibility of the new designs to nuclear weapons blast effects. In a series of three tests in Hawaii in 1965 called Operation Sailor Hat the ship was positioned less than a mile from 500 and 600 ton (0.5 Kt and 0.6 Kt) blasts of conventional explosives. The information learned from studying the blast effects was used to design new generations of ships, including Aegis cruisers and frigates. The last operational Cleveland class ship was the USS Oklahoma City CG-5, formerly CLG-5 and CL-91. The OK City was retired in 1979 after nearly 22 years of service, the longest service record of all ships of the class. Twenty two ships of this class were scrapped by 1978, and four were sunk as targets or test platforms. The only surviving Cleveland class ship is the USS Little Rock, CG-4, formerly CLG-4 and CL-92. This ship is preserved at the Buffalo and Erie County Naval and Military Park in Buffalo, New York. For excellent histories of Cleveland class ships during WWII visit the USS Denver CL-58, and USS Astoria, CL-90. The book Night Work by Fletcher Pratt tells the story of Task Force 39 that was composed of USS Cleveland CL-55, USS Columbia CL-56, USS Montpelier CL-57 and USS Denver CL-58. It gives a very good description of the ships' activities in the brutal Solomon Islands campaigns early in WWII. Night Work, Fletcher Pratt, Henry Holt and Co., New York, NY, 1946, 265 pages. Pacific War Diary by James Fahey gives an excellent description of an ordinary Seaman's life on the USS Montpelier CL-57 from the Solomons campaign in 1942 to the end of WWII in Japan. Pacific War Diary, James J. Fahey, Kensington Publishing Corp., New York, NY, 1963, 404 pages.